Baldwin Filters' new EnduraCube air filters have depth-loading media technology. Baldwin Filters, a Parker Hannifin brand, has introduced its new line of EnduraCube air filters, with depth-loading media technology. The EnduraCube air filters have multi-layered, synthetic media which can trap and hold more dirt per square inch. The enhanced media technology provides higher initial efficiency and is water resistant, ensuring that tears and holes do not develop when it is exposed to water. The EnduraCube design features a strong, stable media pack, with one continuous media web, eliminating possible leak paths which are common in stacked paper media. A rigid plastic frame and end caps add structural strength and stability to the media protective panels, which in turn reduces the risk of rips, tears and punctures. 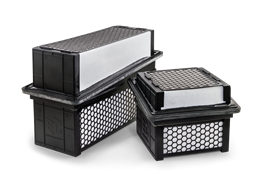 Baldwin’s EnduraCube air filters are designed to work in tough conditions. In rigorous endurance testing, EnduraCube air filters demonstrated high levels of structural integrity. Testing against the OE filter shows the EnduraCube air filters do not tear or separate from air pressure, vehicle vibration or high temperatures, as the OE filter can do. Marathon Health has opened an onsite health centre at Baldwin Filters’ facility in Kearney, Nebraska, USA.